If you choose this method of payment you will be automatically forwarded to your own bank. Your payment will be made in your own familiar online banking environment. 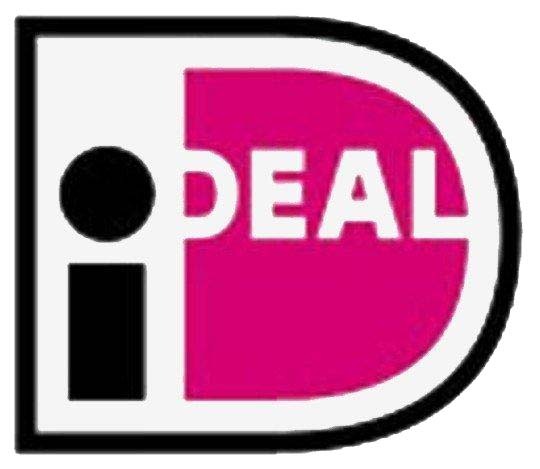 If you have internet banking you can use iDEAL, without having to sign up. This payment is only possible for orders within the Netherlands. This payment method is free of charge. You can enter your credit card information safely on our secure website. We will work together with your credit card issuer to ensure proper handling of your payment. This payment method is free of charge. Only for CC with 3D secure code. Once you have chosen to pay by bank transfer, you will receive a pop-up with the payment details, which will also be sent to your e-mail. Your order will be sent once the payment has been received by us. This payment method is free of charge. This payment method is especially for our Belgian customers. This method allows you to pay securely electronically. This payment method is free of charge. During the ordering process, you can choose from one of the above payment options. Once you have chosen the method of payment at the end of your order, you enter the secure environment of Mollie payments to complete the payment. After completing the payment you will receive a confirmation email directly from us. All prices are VAT included. If you have problems with the payment you can login in "my account" and finish the payment. You can still choose all payment methods. As soon as your parcel arrives at the selected parcelshop you will receive a notification (mail). The parcel can be collected with your I.D. for 1 week. After 1 week the parcel will be returned to sender. On the morning of delivery, when the driver takes off, you will receive a notification (mail) from DPD in which they inform your the delivery time with a time table of 1 hour. If nobody is home to receive the parel you can use the link in the mail to inform DPD your preferences, like delivery to neighbour at a certain number or to a parcelshop near your address. We have a delivery period of 2-3 days for orders that are directly paid for. When payment is done by bank transfer the delivery period depends on the moment payment is received.